Who doesn’t love a treasure hunt? I know 6yo does and she’s often hiding things around the house for me to find. 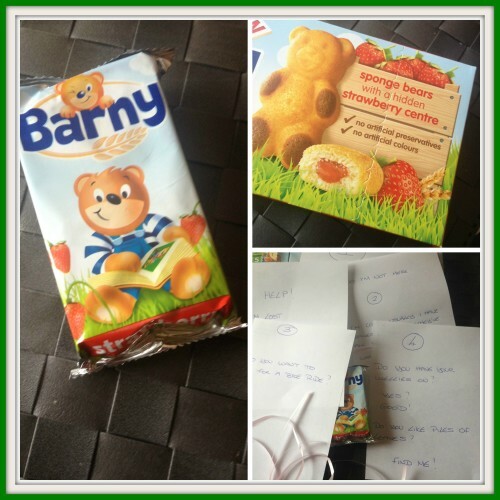 When we received a selection of Barny Bear cakes to have a winter adventure with, I knew a treasure hunt was the way to go. I started off preparing the clues for 6yo to follow. It was also good practice for her reading, and a sneaky way to make reading fun. Our treasure hunt was taking place in the garden so I could tailor the clues and hide the prize! Can you see something hiding in the leaves? Wellies on and off we went! The first clue was discovered quickly, but the second got her thinking for a few seconds before she looked around the garden to spot the next clue hiding. The final clue got her thinking! But then she was off! Yay the treasure has been found! Mmmm yummy! I’m not sure why she was looking at the sky eating the treasure though! Plenty of jumping on the trampoline followed. Aw, lovely post, I’ve yet to write our’s up although we had a rather rainy, windy day for ours so didn’t stay out long. Looks like she’s enjoying her Barny bear though! That’s just the sort of treasure worth tracking down – love it! Good luck. What a great idea to get out in the garden with, kids love treasure hunts don’t they? Glad you had fun. What a great idea! Love the fact that she can be learning whilst having fun. Treasure hunts are brilliant fun! I sometimes buy up gold coins when they are cheap after christmas, then use them to lay trails! What a lovely idea, a cake as a reward too, I like your kind of treasure hunts! I’m loving all these Barny Bear posts – so much fun 🙂 we love a good treasure hunt. You are the best mum! I’m afraid I’d have just handed the snack over – looks yummy though! We did this back in September, loved the Barny and the challenge ourselves! Lovely idea! “We’re all going on a Bear Hunt”! Yay looks like such fun was had! Everyone loves a treasure hunt especially with treats! Looks like she had great fun – mine love Barny cakes too!! Fabulous post. Got to love a treasure hunt. Commenting for myself and on behalf of BritMums and thanking you for taking part. and some people say you can not have fun in your own back garden… how wrong are they? !